The Saab Music Corps is an amateur band from Linkoping, Sweden. 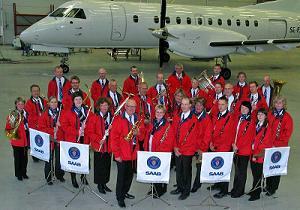 Founded by the Saab Company in 1940, the Saab Music Corps has about 35 members. Ages range between 20 to 75 years. Originally, all musicians in the band were Saab employees, but now most members are recruited outside the company. The Saab Music Corps is an independent association engaged by Saab at major events such as Roll Outs, Air Shows, shareholders meetings, major employee activities, etc. The Corps arranges concerts of its own, often with popular professional vocal or instrumental soloists, and is also engaged by other organizations to entertain at public and private events. The Saab Music Corps plays a broad repertoire of popular entertainment and easy-listening music, such as ABBA, the Beatles, Elvis, evergreens, folk songs, musicals, classical tunes, dance music and traditional marches. The Saab Music Corps has had several conductors since its inception in 1940. The most recent conductors are Ingemar Wåhlin, (1972 - 2004) and Arvid Johansson who took the baton upon Ingemar’s passing. The new CD, "En hyllning till Ingemar Wåhlin" is a tribute to Ingemar who arranged many of the pieces in the Saab Music Corps’ repertoire.